Growing up in a business atmosphere Preston learned many facets of customer service, negotiating, construction and sales from his father. His father ran a Real Estate business (also “Shepherd and Associates”) in Texas during the 1970’s. His father taught him many skills in construction that he is still thankful for and has done many home projects such as finishing several basements using his wood working and plumbing skills. Preston had a dream even back then of a career in Real Estate. After receiving a Business Degree from Texas Tech in “Finance”, he actually began an MBA program in “Real Estate”. It was during this time, that his love for the ministry led him in a different direction and he changed his studies to pursue a Masters Degree in “Ministry and Missions” from Pepperdine University. This his new wife and he pursued for 23 years living all over the USA and even in the Philippines (6 years) and Japan (2 years). In 2003, the Shepherds made a decision to leave the ministry and move back to Denver to settle their family and be with Sandie’s parents during their golden years. This proved to be an excellent time to fulfill their “real estate dreams” and Preston and Sandie became licensed Agents! In 2007, they began their own company – “Shepherd and Associates Realty” and have been in the top producing Real Estate Agents in Denver ever since! Their attention to detail and superior market knowledge give their clients a competitive edge in any market. In working together, Preston is able to offer a variety of services from construction needs to understanding complex financing. Sandie has proven to be incredibly valuable using her degree and training in “Interior Design”. With over 10 years of real estate experience and having been involved in a wide variety of market conditions, Preston and Sandie offer a wealth of knowledge and true professionalism! Buying a home is an exciting time in one's life. Making the smart move of choosing a Real Estate Agent is your first step to ensuring that your new home and community meets your needs. We pride myself on repeat business and hope you'll come to understand why. As your Real Estate Team, we will: - Assure that you see all the properties in the area that meet your criteria. - Guide you through the entire home buying process, from finding homes to look at, to getting the best financing. - Make sure you don't pay too much for your new home and help you avoid costly mistakes. We'll answer all of your questions about the local market area, including schools, neighborhoods, the local economy, and more. 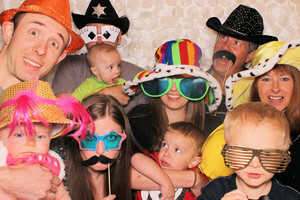 Outside of business, the Shepherds enjoy time with their family and their four grandchildren! They remain very active in the ministry and host a “House Church” every Sunday at their home. They also love to work-out and exercise at the Castle Rock Rec-Center, take time to improve his golf game, play softball, racquetball, and tennis. When Preston Shepherd heard of a little boy named Maurice who was in desperate need of a bone marrow transplant, he felt the urge to help. Shortly afterwards, he spoke at a rally that prompted 600 volunteers to sign-up on the national bone marrow registry for those needing this life-saving transplant. Out of a million people in the world-wide donor files, Preston’s type was the only one that matched with a young woman (Joan) suffering from leukemia. The operation within the next few months was a complete success and the two are friends to this day. His bone marrow donation was literally a one-in-a-million gift! Preston and Sandie’s love for people led them from work in the ministry to Vice President positions for HOPE worldwide, a volunteer relief organization. He and Sandie, along with their two daughters have worked with people in need all over the world. They even led an effort that raised over $200,000 in funds for the Multiple Sclerosis Society. Their work with orphans, AIDS patients in Cambodia and trash-sorting communities in the Philippines, has had a profound impact on their family by fostering a genuine love for different people and different cultures. Being able to share a meal with families who live in utter poverty has shown them what really matters most in life. 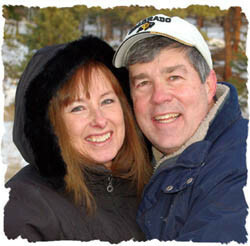 Despite having lived all around the world, Preston and Sandie have always considered Colorado to be their home. Sandie’s ties to Colorado run deep, dating back to her great-grandmother’s homestead journey in a covered wagon in 1884. Her family still operates the same farm in northeastern Colorado to this day. The high-light of Sandie’s day is often her daily walk on the trails in the area. “No matter what kind of day I am having, the beauty of the mountains always helps me to re-set my perspective,” reflects Sandie. Because Preston and Sandie believe so much in helping others, they have taught their two daughters to do the same. Christie and Jennifer have always appreciated their years overseas - going to school for six years in the Philippines and Japan. It taught them a whole different perspective on values and responsibilities. They are now both married to strong young men and beginning to raise families of their own. They have given Preston and Sandie 4 grandchildren so far! There is another girl in the Shepherd family: a bichon dog, Buffy (named after the University of Colorado mascot). You may spot Preston and Sandie walking Buffy in your neighborhood on one of their daily walks! Whether they are out playing tennis or softball, or working in their career as Real Estate professionals, the Shepherd’s never lose sight of what really matters to them. Their faith, dedication to people and desire to help others reach their dreams, motivated their decision to choose careers in Real Estate. Preston’s background in finance enables him to offer sound financial guidance to his clients. Her interior design experience has given Sandie the tools to make a house a home. Further, their experience living overseas has given them firsthand knowledge of how relocation can impact families. Preston and Sandie’s honesty and integrity in working with others have already earned them a well-deserved reputation for outstanding professional service and commitment to their clients. No matter what your needs, the Shepherd’s will take the time to listen and understand your real estate goals to reflect what matters most to you. 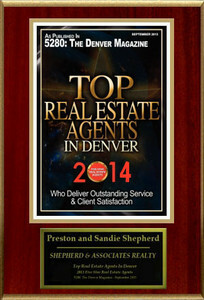 Preston and Sandie Named to the 5280 Magazine List of Denver Real Estate Agents that "Provide Exceptional Service and Overall Satisfaction"
Preston and Sandie have received this honor for 5 consective years. 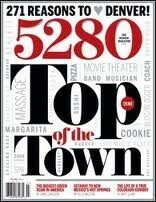 This award is given through a polling of the readers of the popular Denver magazine.